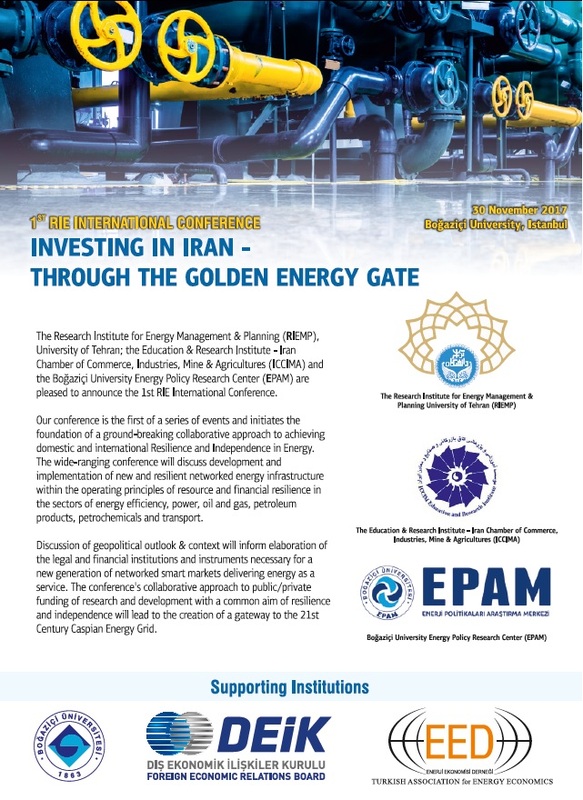 The Research Institute for Energy Management & Planning (RIEMP), University of Tehran; the Education & Research Institute - Iran Chamber of Commerce, Industries, Mine & Agricultures (ICCIMA) and the Boğaziçi University Energy Policy Research Center (EPAM) are pleased to announce the 1st RIE International Conference. The conference is the first of a series of events and initiates the foundation of a ground-breaking collaborative approach to achieving domestic and international Resilience and Independence in Energy. The wide-ranging conference will discuss development and implementation of new and resilient networked energy infrastructure within the operating principles of resource and financial resilience in the sectors of energy efficiency, power, oil and gas, petroleum products, petrochemicals and transport. Discussion of geopolitical outlook & context will inform elaboration of the legal and financial institutions and instruments necessary for a new generation of networked smart markets delivering energy as a service. The conference's collaborative approach to public/private funding of research and development with a common aim of resilience and independence will lead to the creation of a gateway to the 21st Century Caspian Energy Grid.